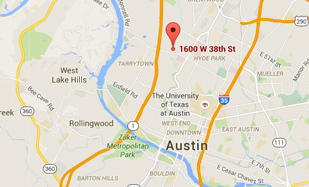 “Because of Dr. Geck I am pain free. Thanks for giving QUALITY back to my life,” Cyndi exclaims. Click here to download a PDF of Cyndi's story. 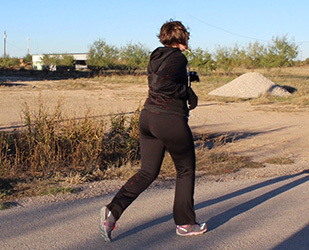 Photos below: These photos were taken at her first 5K! 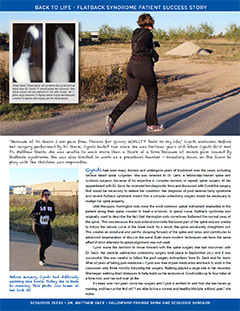 Before her surgery performed by Dr. Geck, Cyndi hadn’t run since she was thirteen years old. When Cyndi first met Dr. Matthew Geck, she was unable to walk more than a block at a time because of severe pain caused by flatback syndrome. She was also limited in work as a preschool teacher — kneeling down on the floor to play with the children was impossible. Cyndi had seen many doctors and undergone years of treatment over the years, including several failed spine surgeries. She was referred to Dr. Geck, a fellowship-trained spine and scoliosis surgeon, because of his expertise in complex revision, or repeat, spine surgery. At her appointment with Dr. Geck, he reviewed her diagnostic films and discussed with Cyndi the surgery that would be necessary to relieve her condition. 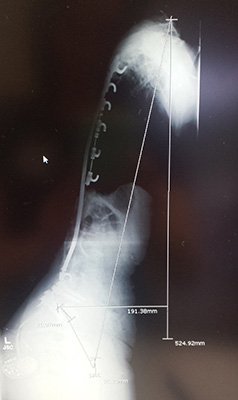 Her diagnosis of post-laminectomy syndrome and severe flatback syndrome meant that a complex osteotomy surgery would be necessary to realign her spine properly. 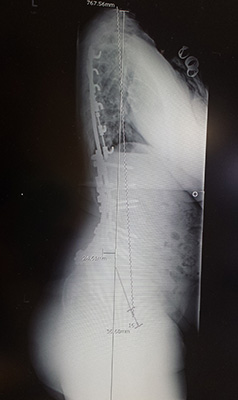 Until the 1990s, Harrington rods were the most common spinal instrument implanted in the patient along their spinal column to treat a scoliosis, or spinal curve. Flatback syndrome was originally used to describe the fact that Harrington rods sometimes flattened the normal sway of the spine. This was because the rods extend down into the lower part of the spine and are unable to follow the natural curve of the lower back. As a result, the spine unnaturally straightens out. This creates an unnatural and painful stooping forward of the spine and torso, and contributes to advanced degeneration of discs in the spine. Even more modern techniques can have the same effect if strict attention to spinal alignment was not used. Cyndi made the decision to move forward with the spine surgery she had discussed with Dr. Geck. Her pedicle subtraction osteotomy surgery took place in September 2013 and it was successful. She was careful to follow the post surgery instructions from Dr. Geck and his team. After 10 years of taking pain medicine— Cyndi was free of pain medication and back to work in the classroom only three months following her surgery. Walking played a large role in her recovery. She began walking short distances to help build up her endurance. Cyndi walks up to four miles at a time now, and has lost over 30 lbs. 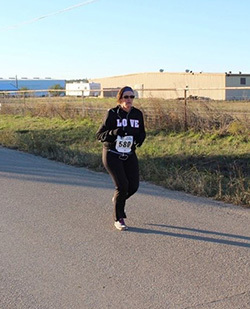 It’s been over two years since her surgery and Cyndi is excited to add that she has taken up running, and has run her first 5K! “I am able to live a normal and healthy lifestyle, without pain,” she notes. X-Rays reveal: pre-op lateral view (L) and post-op lateral view (R). Cyndi’s T1 anterior plumb line measured 19cm before surgery and was improved to 2cm after surgery. Her T1 pelvic angle measured 37 degrees before surgery and measured a normal 16 degrees after surgery, and she stands upright.